New to you a year ago Sep 13 => Has it stood the test of time? Add an entry with the same game you chose for the New To You Sep 12 geeklist. Link to your entry in that geeklist, then write down your thoughts on the game you chose a year on. If your impression of some of the other games you wrote up that month have changed, let us know about that too. The hot game that month was Android: Netrunner - has it stood the test of time? Item for Geeklist "New To You September 2012 => Best new boardgame"
I'm surprised to see that I've only played Las Vegas twice since last September. I guess that fits my opinion of it as a good but not earth-shattering dice filler. Jackal & High and Qwixx have both taken turns in that niche subsequently. The shine came off Libertalia a bit with my two further plays. There are bits of the design I really like but each time it's run about half an hour longer than I wanted, to the extent that the third 'week' of the last game I played felt like a chore. No further plays for any of the others, though I'd happily give Turn the Tide another spin. Last year I chose Village as the best new game, and we've played it a few times more since then, and got the expansion Village: Inn as well. I changed my opinion on Ascension: Storm of Souls, especially with the Ascension: Immortal Heroes expansion, together they add some nice things to the base game. We don't own this, but regularly play this at a friends house (generally as the last (quickish) game of the evening. The Lord of the Rings: The Card Game wasn't as memorable, we'd borrowed the game at the time, and I haven't missed it after returning it to its owner. We picked up Magestorm at Essen last year (it was very cheap at the Heiderberger dump stands, but haven't gotten 'round to playing it. Sandwich and Such a Thing? are party games I'd rather not play again. Zooloretto: The Dice Game has faded from memory. Last September was pretty tame for new games. In fact, I only played one truly new game that month - the other 2 were kind of cheats. Plato 3000 - 1 play last September, 24 plays since. This has become the game my wife and I go to when we need something light and quick. It's never going to blow anyone away, but it's very good at what it does. I had played this previously as Utopian Rummy. Railways of the World: The Card Game - 2 plays last Spetember, 0 plays since. A nice, light card game but there are just too many other card games that we prefer. Glory to Rome (Black Box) - 1 play last September, 0 plays since. I had previously played the IV edition of GtR. Innovation is my favorite game, but Glory to Rome just never caught on with me the way I hoped it would. Two yesses and one no. The first yes is Metropolys, which I now have played 5 times and I like bunches and bunches. It's a kind of spatial auction, and it's that sweet combo of "easy to teach" and "rewards & encourages lots of play." The second yes is 1889: History of Shikoku Railways, which I've also now played 5 times. My 18xx group can play it in around 2 hours, and we've used it as an intro/teaching game a couple times. I was thrilled to get a copy on the secondary market because there really is no primary market for it right now. 1889 is the best attempt at "smaller 1830" I've seen yet. The no is Assyria, which is another Ystari title. It's not awful, and it is more interactive than your standard & stereotypical Euro. But it's just...it's not that exciting, is it? It's getting worse for new gameplays around this corner of the world! Just two this month. 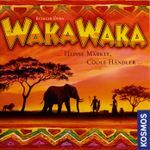 Waka Waka was moderately interesting at first, but after two or three further plays, there just didn't seem to be enough to do. It doesn't climb off the shelf half often enough to make it worthwhile these days. Might go off on trade soon. My only other first-timer was Dominion: Dark Ages. One of my favourite of the Dominion family, but also one of the most infuriating. Playing this box well and accurately is going to take plenty of practice. Apparently, Extended Stats, where I cull my 'First Plays' from, is trying to wind me up. I have got several other new plays! Medieval Mastery won me no friends after I was virtually eliminated from the game on my second turn and I sat and did literally nothing constructive for the next 35 minutes. This is one of the few games that I will actively go out of my way to avoid playing again. Alien Frontiers was OK, but not really worthy of the Kickstarter hype. It's too reliant on daft combos and dull-as-my-arse area control. I will play it again without too much fuss, but I don't think I could ever take it seriously. Eketorp has required a little house-ruling to convert it into a passable game, but it's really only a bit of fun and doesn't need 150 minutes of table time to prove it. Android Netrunner has been played five times since we got it last year. We're not huge Netrunner players, but - when I get into it - it gets played a lot. Cool game, great theme. Coloretto has gotten played twice since last year. It's a nice simple card game. I'm not wowed by it, but it's a game collection staple and isn't going anywhere. 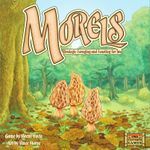 Here is my original entry to the geeklist: Item for Geeklist "New To You September 2012 => Best new boardgame"
I have not had to play Hotel Samoa, Spot it!, or Buccaneer since. Awesome. 6 Nimmt (5) and It's Alive! (7) I enjoy very much, am glad to own, but they don't see much play. Neither are games that particularly fit with the groups I play with most often. I enjoyed my plays of Coloretto (1), Penguin Party (1), Core Worlds (2) and Briefcase (2) but not enough to track them down for my own collection. I'd always be happy to play any of them and if I see them cheap they'll be hard to resist. I very much enjoyed my plays of both Vanuatu (1*) and Fairy Tale (1). The feeling I would hate Vanuatu with more plays never went away and despite the fun I had the first time, I still don't feel the need to own it. Luckily it's now available to play online, so I'm getting my fix that way - especially good as I don't get as frustrated at losing online as I'm sure I would if I did in person! I still intend to grab a copy of Fairy Tale - in fact I've been in an on/off trade for it for months. I think what has stopped me really trying hard to get a copy is the feeling better drafting games are just around the corner. It was actually too close to call as a favourite between these two; I only chose Kingdom Builder (7) because it had more plays than Acquire (3). Both are wonderful, clever abstract games that do things differently enough from other games to stand out. They also both play pretty quickly while packing in plenty of strategic depth - and at the same time are new player friendly. Great games that every gamer should at least try, if not own. 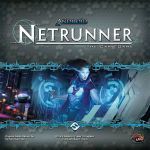 Netrunner has experienced overwhelming success in the past year, surging to elite levels in the rankings. My BIL and I love the theme and enjoyed the asymmetrical play, but it has yet to see any more play. Even if we did I don't see us going crazy and picking up every expansion (or any for that matter) to add to the game. Given that he and I are the only two interested in playing it and we don't get much play time as it is I only expect rare plays. My BIL is not a regular gamer. When he and I do get play time together we tend to go with either Memoir '44 or Summoner Wars. ...Rivals for Catan: Age of Darkness ...introduced three more theme decks to one of our favorite 2p games. We had the opportunity to break out the Era of Intrigue deck to start learning the cards. Our next play will break out another deck. We are looking forward to having six decks in the mix when we finally get back to the Dual of Princes variant making for some interesting combinations. We've played the second theme deck, Era of Master Merchants, since cracking this expansion open for a few plays last September. 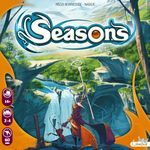 We enjoy playing these themed decks and agree it is a great 2p game and Catan option it just hasn't seen much play time as our collection of games has expanded. The more good games the harder it is to get all of them to the table. Other games, like those designed by some guy named Feld, grab our attention more often when considering a 2p game. We do not dislike/hate Catan. We don't feel like it has been played out or overly played in our house. In fact, we regularly say we wouldn't mind playing Catan more but again but again it comes down to given more choices which seem more interesting. We will play the third theme deck in this little expansion box. It's a game we enjoy enough that I can say we are not done with it. It's just going to take longer to do so. This game ultimately got published. Deck of Thieves has a simple rule set for quick play start. Th game ends after a player collects 7 gold coins. Players start with their own deck of cards and leverage Character, Item, and Event cards which help them to protect and steal coins to reach the game objective. Cards in your play area contribute to your point total with the highest point total yielding the winner. I broke this one out during a camping trip this summer and my youngest daughter really took to it asking to play it again which is extremely rare. Deck of Thieves had a successful Kickstarter campaign this summer. I've yet to receive a production copy of the game. More than anything I'm curious to compare the production version with the playtest copy I have and see how much it changed from my first experience as a playtester. Vanuatu got only one play in September 2012, nevertheless, I was impressed enough to put it above Biblios. Since then, it's had three more plays - the most recent was in April of this year. I've enjoyed all my plays, even the one where I put myself totally out of contention. My biggest issue with the game is that it plays better with more players and it's rare for me to have more than three at the table. I picked up Biblios while vacationing in France and it got five plays while on that trip and no plays since. It's a good little filler, but I'd just rather play something else if I can. A year ago this month, I'd managed - somewhat unexpectedly - to play six new games and a few new expansions. As usual, I'll list the games in decreasing order of my current enthusiasm, listing the games before the expansions. I'd really enjoyed my game of Hawaii last year. While nowhere near perfect it demonstrated a delightful sense of possibility: there appeared to be lots of things that one could beneficially do - and much of the game seemed to be juggling those possibilities. It wasn't completely coherent; the setup was fiddly; and I was more than a little tempted by the evils of Analysis Paralysis: but I had fun with it. So I'm a bit sad to report I'd not played it again. I'll need to work on that. Edit: Just played it today with son #2. Nice game with 2; we both enjoyed it. Much of my difficulty with this title is that it hangs out in a club with a few other games in my collection (Havoc and Condottiere for two; there are probably others that I think less about.) These are hand-management games with a set of targets that one competes for: the game isn't to win all of them; but instead to choose one's moments well, and win the important ones. That's all well and good, too. But when I want to play a game "like that" I always (always!) reach for Condottiere. It's one we play often enough that there's no thrash in introducing a new game - and we've enough skills built up that a weak player doesn't throw the game to someone else. This one requires a degree of skill from the participants. It's perfectly possible for a novice to toss the game meaninglessly to another player. And while it'd be totally cool to build up the skill level, we've already got it for the older title. So: cool game; well worth playing (with a group of at least modestly experienced players). But not one I can easily get to the table. Still not convinced this is a "game" (as opposed to a social activity like Apples to Apples.) But it's certainly an entertaining social activity, and one I'm happy to experience. This was cool. Even if it was a bit less Acquirey than I'd been led to believe. That's probably just as well, in the end: I really like that family of games (including Stephensons Rocket and Rheinlander) and if this had been one of them, it might have disappointed me. 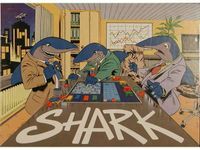 It's a perfectly pleasant family financial game, with opportunity for modest shenanigans (and, perhaps slightly worryingly) a bit more opportunity to benefit one opponent while damaging a third. We saw a couple instances, in hindsight, where a player vaulted himself into a losing position while trying to restrain the "leader" (it wasn't clear that our analysis of who was leading was correct) because a different player was (accidentally?) aided by that decision. If additional play demonstrated that one could usefully scheme to be the recipient of such largesse, I'd be happier: but it seemed chaotic rather than purposeful. Appropriate, perhaps, for a family title. I'd rather enjoyed this one during that first play. But it fared worse in the consideration of hindsight: I found that much of my entertainment was the observation of how the game fit together (and not so much in what I was doing within that framework.) As a result, I've not looked to reprise the play. The failure is likely mine: it appears to be a popular thing. It's a perfectly sensible deck builder. Which, from me, is a bit like a vegetarian claiming that a particular steak preparation is nice. I'm not remotely a fan of deck-builders; Dominion is not my idea of fun. This is an excellent production; it makes sense. But it appeared that there's a limited set of paths through the game, and one won if one chose the path less travelled by one's opponents (much like 7 Wonders) rather than because of any particular tactical or strategic insights. I still could be wrong about it; but I've not looked to play again. The "none since" is mostly the result of my not attempting to get the base game to the table. I thought this was an improvement to the base game. I liked the black cards; it seemed all like a good idea. This just seemed harmless-but-fine. The slight variability to the game start provided a bit more choice; but the game's patterns didn't change dramatically as a result. This was fun to have in the game if only because he matched my lovely daughter's preferred play style. But, really, it's just another Leader; even if it does manage its own entry in the database. Thanks again to my youngsters, the BAP attenders, the back-on-Friday-for-2013 Lunch folk, and the Wednesday Night gang for some great game experiences. I don’t see myself diving into this one as much as I did with Lord of the Rings, but that might change if my friend wants to keep playing it. Well, I definitely dove about as deep as Lord of the Rings and I absolutely love the game. However, as evidenced by other people in this GeekList, it's not for everyone, but if you haven't tried it and you have any interest in deckbuilding (not the game mechanic, but actually building a deck before playing the game) try this game out. Now, we're to the rest. - Dungeons & Dragons: Conquest of Nerath Board Game (Then: 8/10, 1 play; Now: 8/10, 2 plays) was played one more time and I really love the setting, theme, and dice; but I think I'd rather play Nexus Ops in far less time for roughly the same pay off. If I want a longer game, I'd rather play War of the Ring. - Railways of the World (Then: 8/10, 1 play; Now: 7/10, 3 plays) was played two more times, and I quite liked it, but at the end of the day it's the same thing over and over again. I'm looking at trading it away, but I'd happily play it again. - Britainnia (Then: 5/10, 1 play; Now: 5/10, 1 play) was someone else's copy so I haven't played it since and I have no interest. 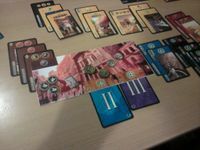 - 7 Wonders: Leaders (Then: 8/10, 1 play; Now: 8/10, 1 play) hasn't been played since I haven't played 7 Wonders in a while. I'd play it again, but considering the base game is a gateway game, it's hard to include expansions. 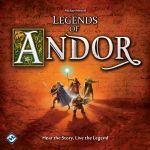 I chose Legends of Andor as the best game of the month a year ago after four plays (playing four legends) of it. I did play the fifth legend after this and I didn't play the game since only because I do not own it. But I still think it's a great "middle ground" game between Euro and AT, family game and gamer's game... A great one from a great artist. 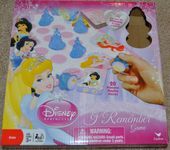 I have also played the children's games mentioned in the list quite a few times since: Rory's Story Cubes is often used for telling bedtime stories and even my son has told me some stories using these since - I have bought all the other sets as well. Hisss is really popular with my kids. We have also played Bunte Runde a few times since; it's not really a children's game but also not a gamer's game - it's something like a "family abstract" if this exists. I haven't played Spectaculum (played 5 times in that month) and Carcassonne: The Discovery (2 plays) since; what's more, I sold these games even if I did see their merits - I just felt I have better games in their category and I would prefer playing those over these. I haven't played Hoity Toity since but would like to. I don't want to replay Dragon Rampage because of the annoying production problems it has (the game itself isn't great either but would not be bad if the presentation was user-friendly). This has most definitely stood the test of time. All three of my plays last September were solitaire to learn the rules. Surprisingly, it's become my wife's favourite game, which is why it's hit the table so many times since then. I expect I'll be playing it another 25 times before September 2014. I still quite enjoy this one. I also bought a copy for a friend last Christmas. I haven't played Carcassonne, Seasons, or Formula D since I tried them last year. Last year my favorite new to me was Santiago. It currently sits at #1 of my favorite games of all time, though I never seem to get to play it as much as I want to. I gave it 4 out of 4 stars last time and I would now give it 5 out 4...say what? You can't have more stars than the maximum number of stars on your scale, that is cheating. I don't care....I love it. I also gave Vegas Showdown 3 1/2 stars out of 4. I haven't gotten to play it again, but surely would (mental reminder...put it on your want to play list) I still have fond memories of playing it. I gave Scrabble Flash 3/4 stars. One of my flashers has a bad battery right now, but I still like the challenge of the game and rearranging letters for words, however, It is surprisingly difficult. I think I've only maxed out the find all the words challenge a couple times. I gave Ruse and Bruise 2 stars, have not played it again and will probably not play it again unless the circumstances play out just right. I have played this one about 10 to 15 times since I bought it. I go through stretches where it does not get played but I am usually at least thinking about getting it to the table. I consider this game the best of my collection. September last year had me try out a bunch of GREAT games for the first time, and you can view my initial impressions here: Item for Geeklist "New To You September 2012 => Best new boardgame"
I have played this a total of 43 times after a year, and I have to say that this has totally lived up to the hype as a fun fast and furious game full of interaction. While it has not hit the table often this days, this DEFINITELY is a keeper! I currently also own the King of Tokyo: Power Up! expansion, plus a few other promo items, including King of Tokyo: Heidelbärger Brockenbär (promo character). This has been played 17 times so far, and has recently seen an upsurge of plays since I have finally taught it to my wife, who has liked it! 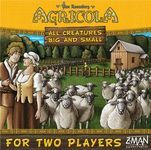 This continues to be the "AGRICOLA" fix game for 2P, and will continue to see plays especially since I have just gotten the Agricola: All Creatures Big and Small – More Buildings Big and Small expansion which I can't wait to try out! 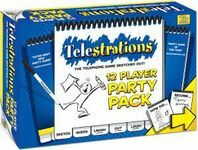 A game which I had initial difficulty getting to the table, this is not not a problem as the guys in my group will not hesitate to jump at the chance to play this. It now is always played with the Eclipse: Rise of the Ancients expansion, though the time required to play this still is a slightly limiting factor to have it brought out often, even though my group can clock in at 30 minutes per player. It has been played 13 times so far, ranging from 2 Players all the way up to 7 Players! Played 21 times so far (with 8 plays during it's first month of play), it has been seeing less time now due to competition from the rest of my growing collection. It still is a relaxing game of set collection, although my wife has tired of it. I can still bring this out to nplay with the gals at my FLGS once in a while. Played 11 times, I've been bringing it out less since it has been a game that I have been unable to master, and to be honest it is a bit dry. However, it maintains its niche a light-medium tile layer, and I suspect it may get more plays if and when I teach this to my daughter and wife. This has been played only 8 times, and that is because I have only found it appropriate to be played with my Warhammer 40,000 group, who I feel can handle the chaos better than my family and the gals at my FLGS. It still is requested once in a while so it will slowly gain more plays for sure. This has only been brought out 4 times, and this is only when my son Sherwin's gang visits and has the time to play. Still, I have kept up to date by collecting the expansions plus some promo minis, and I hope the boys will have time soon to visit so that this can be brought out again. Played just once last year when it was demoed to me. It was fun, but I did not feel the need to get it. I wouldn't mind playing it though if given a chance again. This months I'm doing list bottom side up. Games I'm actively avoiding since first play. Was it a problem that we played with expansion? I remember a gruelling long game, with maybe 2 decisions per game. And the game basically just throws illustrations and plastics in your face so you wouldn't notice it's just set collecting. The traitor is too weak to make a serious impact and doesn't make the interactive space come alive (enough). 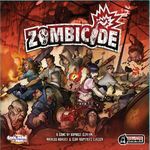 How this gets such a high praise from Dice Tower is above me - seems like convoluted mess where the only thing not included is a game. Played this as a night of Cuba "trilogy" with Cuba (without expansion), Havana and this. I am at loss here. Cuba itself is just a bunch of stuff thrown together and not all mechanics are even relevant every game. But it does allow for some long term decisions. Well, this one doesn't. Turn stuff into stuff, grab points, be done with it. Mediocre would be a praise. The most weird thing about this game is the existence of Havana - that is actually a very good game and it's also derived from Cuba. It's like Havana kept all the good bits and make them better (role selection) and SdC took the rest and showed they were bland to start with. Anybody looking at this game, take a look at Havana instead. It's a game I want to like, but I had one bad experience. First time I played it seemed like somebody cut all the fat out of that slow moving hog of BSG. Yay. Unfortunately they cut too deep and left just bare bones. For me it's too focused and tense for that 20 minutes (my people don't get the idea of frequently voting against a mission) and lacks a narrative. A story which would put some meat on these bones and make the game a bit of a ride (like 45 minutes perhaps). So we tried to roleplay. We went with 'Alo 'alo theme of zee french rezistance. And it worked. But then we added the "plot thickens" expansion and the game just flopped for me. What happened was that there's too much stuff going on and people started to deduce out loud and make logical comments. And killed the roleplay instantly. So the game became longer for sake of stupid arguments. Woo hoo. I've played a game since then, but just took at as a filler, something I'm not interested to invest my creative input in. Maybe Avalon will be better. In the meantime I'm sticking to Werewolves who are still the most fun of all these games and have narrative! (when I moderate anyhow). And then I moderated werevolwes in my club and some people got upset the game isn't fair and some were trying to logically deduce stuff so I had to intervene. No it's not fair, no, keep your logic out of it - ever seen a horror movies when someone logically deduces? They're dead the next second! It's about experience and good old lolz. I included Ra on one previous list, but this was the time I actually 'got' the game and played it by correct rules. I'm conflicted about these two. Ra has better tension and better theme implementation, yet I'm constantly thinking of my solo plays of PoR. Something about cute visuals that connected to autumn hues and my walks the last September. So Ideally I want Ra that looks like PoR and I'd be überhappy. Thinking if it can be done with cards. Played this game as a filler last weekend. It was easy to learn and played quite cleanly and I actually quite liked it. The game itself is a card-driven dungeon crawl; each player chooses a standard adventurer-type (e.g wizard, warrior, thief & etc) to join the party and explore the dungeon. In the course of this exploration the objective is to acquire the most gold and not die. Unlike a lot of fillers players can be eliminated in this game. The mechanism driving the game is the playing of either one-use special item cards or standard action cards with a value of 1 to 5 as the five areas on each level of the dungeon are explored. This is a pretty good sort of mechanism as it can force interesting decisions on players as monsters have to be dealt with, treasure amassed and other loot grabbed in order to win the game. There is a 'bash the leader' mechanism which can stop some-one racing away with too much gold, but another player will have to be willing to play one of their higher value cards to activate it. Not a bad game, and if you're up for a good silly dungeon crawl themed game it's certianly a much better option than anything from the Munchkin franchise. All-in-all, a good solid filler and one I would play again and even consider purchasing. No further games of Dungeon Raiders in the last 12 months. This is not due to a refusal to play, rather, it's down to the opportunity not arising. I haven't seen it for sale either (not that I've been looking that hard) but am still open to picking it up if the opportunity presents itself, though I should say that after playing both, I am more likely to purchase Love Letter than Dungeon Raiders if I am shopping for a quick, fun filler. My opinions have mostly remained the same since I first played these last year. I still love this game. The engine building, upgrading and balancing of each currency greatly appeals to me. However, I'm not much of a direct conflict person so I play with the peaceful variant, and add strength to the points at the end. Also I find that the advanced game offers the best time/enjoyment ratio compared to the full game. My 2 player games take around 90 minutes. This is an ok social game, but it is sort of long at around an hour. I'm also not much of a trading and negotiation person. I thought this would be a game that I would love as it has multiple paths to victory and the mancala aspect seemed interesting. However, I found out that I actually do want a slightly stronger theme to keep myself engaged with the game instead of feeling like I'm just doing a bunch of work. Also I have learned now that I'm not a huge fan of points or mechanics salads. I first played Seasons at the end of September last year. 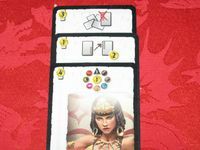 At the time it felt new and fresh, if slightly fiddly, however, once all the cards were learnt, and game-play became reliant upon the initial draft, it felt much more rote, too much like a chore, and I stopped improving. I was slightly disappointed as I thought it had the potential of an evergreen but found it lacked the depth required for more than the 100 or so games I clocked up. Having not played it for over 6 months, and only twice with the expansion, I might go back to it to see if it has become less stale. The Castles of Burgundy was a bargain we picked up for just over £20 and played it immediately. Teri and I both enjoy it but it has become more her game than mine. I enjoy the game and find there are lots of things to do and it keeps me occupied. We have played it roughly every 2 months but Teri plays it more. Takenoko is certainly one of my prettiest games but it is one I still enjoy. I do enjoy meatier Euros but this is one of my go to gateway games for non-gamer friends and family and also if we are burned out and want something light. 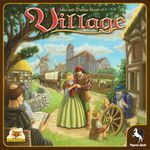 I've played Village twice since last year, including last week (when I played with Village Inn for the first time). Playing only occasionally means I don't remember what I'm doing from play to play and I'm always just muddling through. So Village is in that awkward space where if I played it more I would probably like it more, but I don't quite like it enough to want to play it more. Only two other new games I've played again since last year. I've played Fleet once more. It's okay. I would play it but I don't miss playing it. Freeze Tag is my most played game since last year. I probably overrate it because it's a pyramid game, but it's a fun light game. I only had two new to me games last September. I love 7 Wonders. Both this expansion as well as 7 Wonders: Leaders add a lot of flavor to an already great game, and we can't imagine bringing 7 Wonders to the table without using both. We now consider them essential, and automatically include it without even discussing it. I finally tried Flash Point after some workmates kept talking about it. Turns out to have been a good choice. It solved a lot of the problems that I have with Pandemic, the biggest of which is that Pandemic feels like multi-player solitaire. I've played Pandemic with multiple groups, and in all cases at least one person gets sidelined, and normally one person starts driving the strategy and essentially dictates the turns for everyone. Forcing a rule of no communication just makes the game feel disjointed, frustrating, and also unrealistic. Flash Point's roles are more clearly defined, and the goals for each player based on the role they choose gives them focused parameters. We find that this enables everyone to play and enjoy the game, even those with slower, less strategic thinking. We feel more like we are each cooperating and contributing, which is ultimately what this genre is about. Anytime someone mentions co-op games, and especially when people try to introduce others to the concept of co-op games with Pandemic, I take the opportunity to highlight Flash Point. Pandemic has not been taken out of the closet but one time since we acquired Flash Point, and those plays confirmed for us that Flash Point scratches the same itch, and does so in a much more satisfying way for us. Hmmm... I expected way more than 3 plays of D-Day Dice since those first plays a year ago. 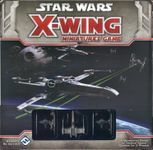 So I don't think its standing the test of time very well, though I did enjoy a fairly recent solo game quite a bit and when my wife saw it out she mentioned we should play it soon... though that hasn't materialized. The barriers to more plays remain long set up time, very fiddly piles of cards to manage and poor scalability upward (it just seems so easy with 3 or 4... I really need to try Atlantikwall some time to see if that helps). All that and competing with Pandemic as our two player Co-op of choice makes this a decidedly plan B game around here. I do get a *lot* of use out of the kickstarter shoulder bag though!